The dramatic images were more similar to the aftermath of Hurricane Katrina in Louisiana than the Golden State, which has been bone dry because of a five-year drought. Residents along Lover's Lane in rural Hollister are crossing their fingers hoping for the sun to peek through the clouds on Thursday so that their waterlogged town in San Benito County can have a chance to dry out. The forecast looked promising. 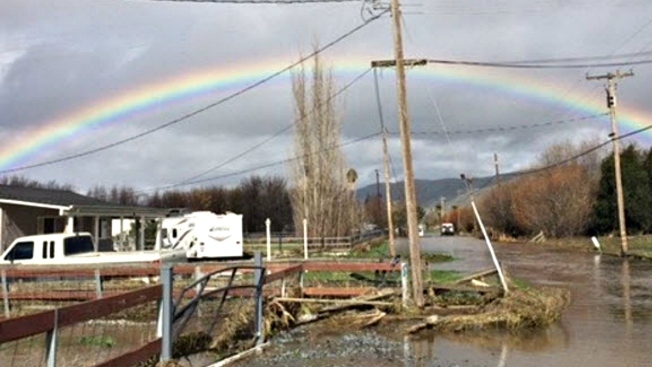 After almost a week of battering rains, which caused the Pacheco Creek to flood and spill across their farmland swallowing homes and prompting 49 rescued and 59 evacuations early Wednesday morning, the showers looked they would be lighter than in the past several day. And beginning on Friday, the sun was supposed to shine through Sunday. Flooding from the Pacheco Creek in Hollister caused homes, trees and cars to be swallowed up by muddy waters. People and animals had to be rescued. This is a video compilation from the the scene. Meanwhile, county officials checked 25 of the 50 homes thoroughly on Thursday to see if they were all safe enough to move in, and the answer was yes. The rest of the homes would be searched throughout the day, according to San Benito County Office of Emergency Manager Kevin O'Neill. He was estimating the damage to be in the millions, a dollar amount the county would likely seek help for from the state or federal governments. The news about no-home damage was uplifting for residents including Steven Vail, among the dozens evacuated. When he opened the door to his home on Wednesday, the water came rushing in. "Once it got higher, my refrigerator tipped over and started floating around my house," he said. "It was just a disaster." 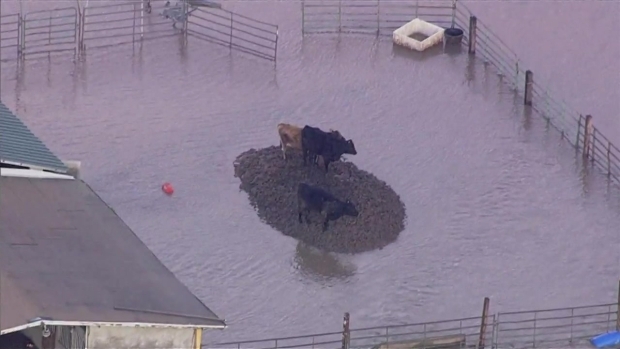 The flooded-out town, located at the northern end of what is considered Central California, posed an odd sight in California, which has been stricken by drought for the last half-decade. The NBC Bay Area chopper flew overhead, showing dramatic images that seemed more similar to the aftermath of Hurricane Katrina in Louisiana than the Golden State, which has been bone dry the last five winters. 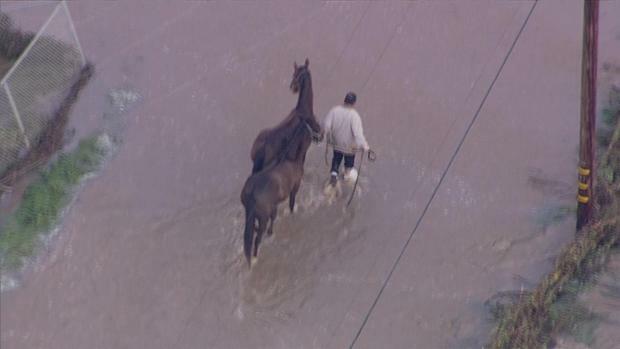 Aerial video showed entire homes swallowed up by muddy waters, cars getting stuck and horses and cattle being escorted to safety. But there was a bright spot. At some point in the afternoon, a rainbow appears in the sky. NBC Bay Area's Kris Sanchez, Shawn Murphy and Matthew Ulrich contributed to this report. Palm trees swallowed in Hollister floods. Is this really California?